Train caboose in bakery, 1946. Pacific Tsunami Museum: Lee Hatada Collection. The threat of a tsunami is an ever-present reality for all who live in Hawai‘i, and for our island visitors. 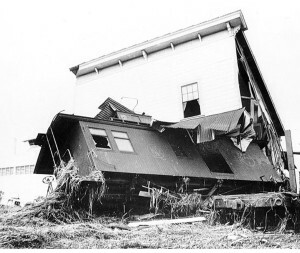 In 1997, First Hawaiian Bank donated its Kamehameha Branch building in historic downtown Hilo as a permanent site for the Pacific Tsunami Museum, which was co-founded by Dr. Walter Dudley and Jeanne Branch Johnston. The Museum is not only a superb repository of oral histories, information, and images pertaining to the tsunami phenomenon in Hawai‘i, but captivates visitors, residents, and students of all ages with its educational and visually compelling exhibits. The Museum stresses that, through awareness and education, no one in our Islands should ever again die as the result of a tsunami. Whether you lived through the tsunami that devastated Hilo in 1946 or in 1960, or have only heard the news reports, you’ll appreciate this poignant presentation by Kini Elia-Gonzalez of the Pacific Tsunami Museum, which serves as a testament to the perseverance of communities to rebuild their lives in the aftermath of disaster.